So, we’ve made beer, and mead. What else can we ferment? How about apple cider? 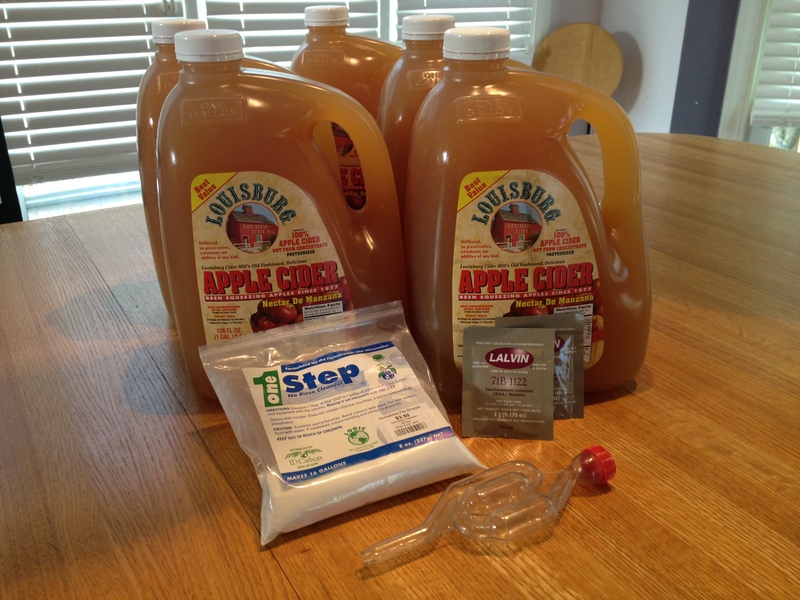 A quick web search brought up a ton of very simple recipes for “hard” or alcohic apple cider. The Louisburg Cider Mill, about 20 minutes south of Kansas City, has been pressing apples into cider since 1977. I picked up 5 gallons of their fresh cider (and a few cider doughnuts). I also grabbed 2 packets of Lalvin 71b-1122 dry wine yeast at a beer/wine supply store. These were only 85 cents each. We poured the 5 gallons of cider into our large pot that we use for beer. Then we simmered the mixture over medium heat for 45 minutes. This kills the natural wild yeast and bacteria that is present in the cider. 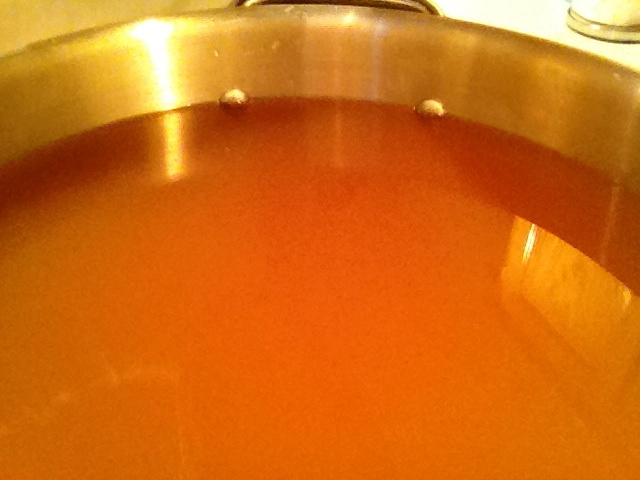 You don’t want the cider to boil, or pectins can form which change the flavor of the cider and make it cloudy. While heating the cider, we added 2 pounds of brown sugar. This boosts the sugar content of the mixture which leads to greater alcohol production. 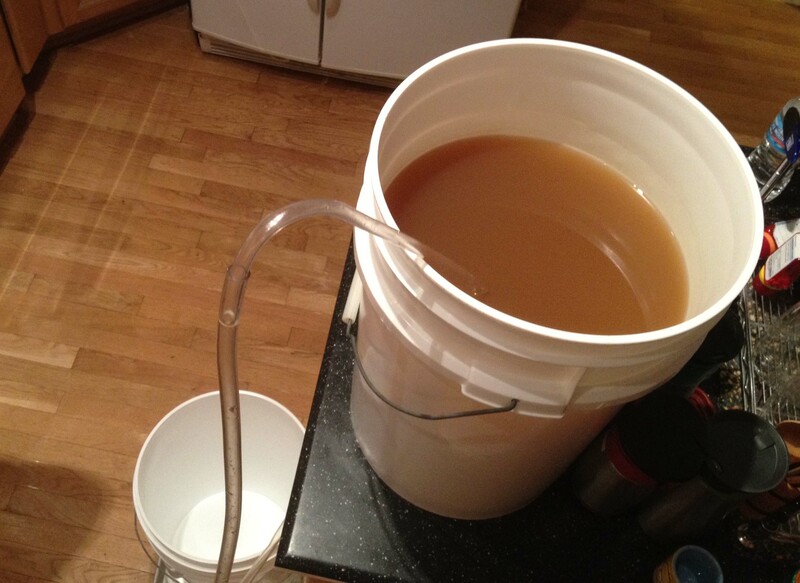 After 45 minutes, we poured the mixture into our large primary fermentation bucket. 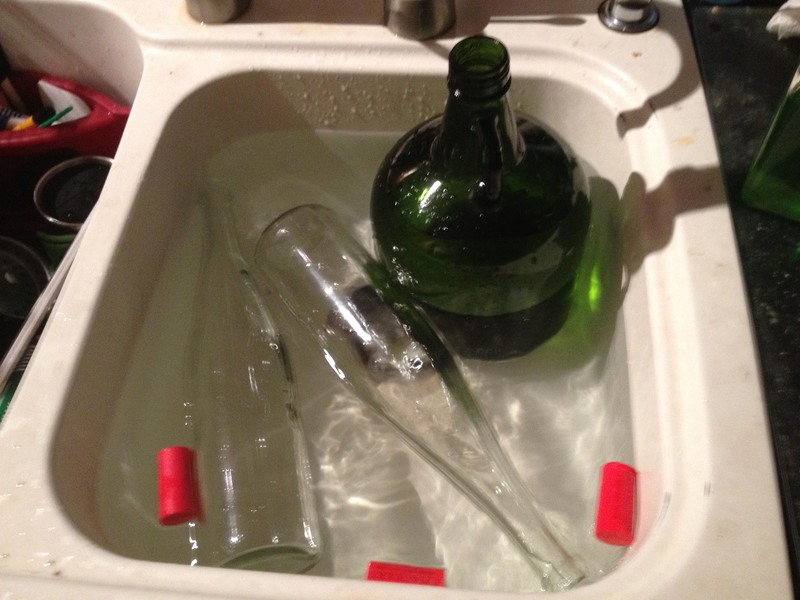 Before adding or “pitching” the yeast, the cider needs to cool down to room temperature. We put the bucket into our sink with cold water and ice to help speed the process along. 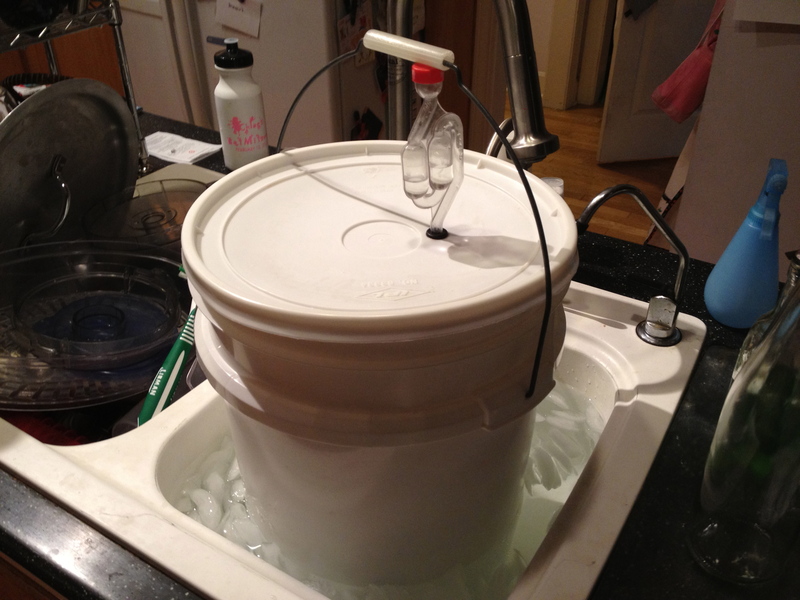 Once the cider reached room temperature, we pitched the yeast and sealed the bucket up. Now it sits downstairs (next to the mead) in a dark cool corner of our basement for 3 weeks to ferment. The cider has been bottled, tasted and tasted again! According to our calculations (I was a psych major, YOU do the math…) there is about 8.7% alcohol. 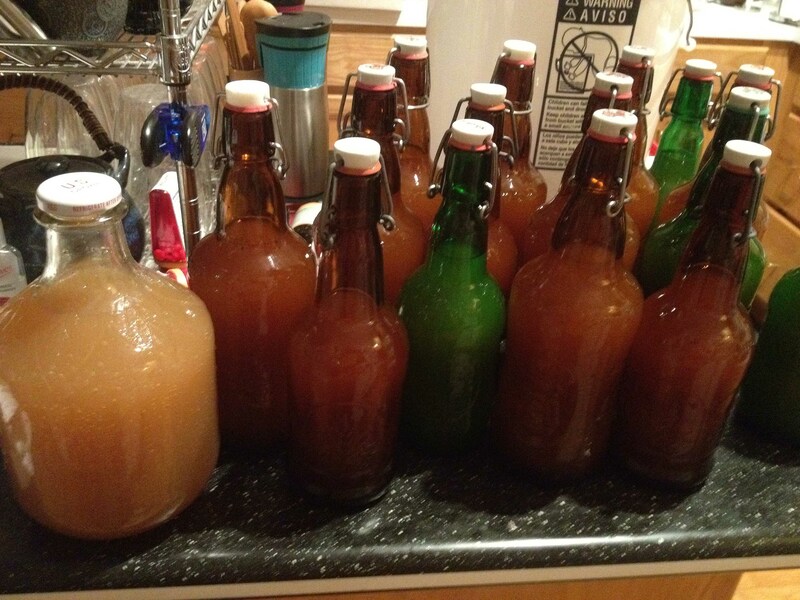 We put the cider into beer bottles with their own caps, and a few larger bottles with corks and screw tops. 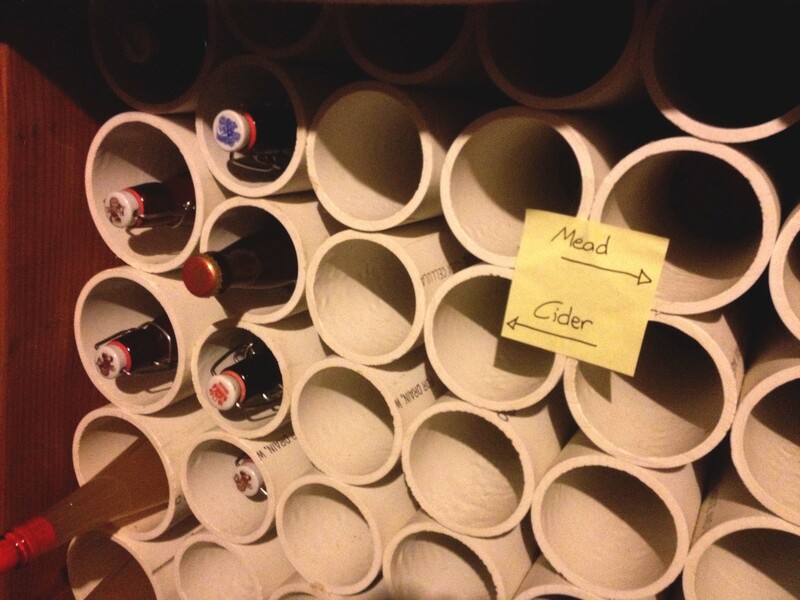 The bottles were stored in my custom PVC tubing cabinet along with the mead we made a few months back. The cider is definitely strong, but isn’t as sweet at it will be in a few weeks or months. 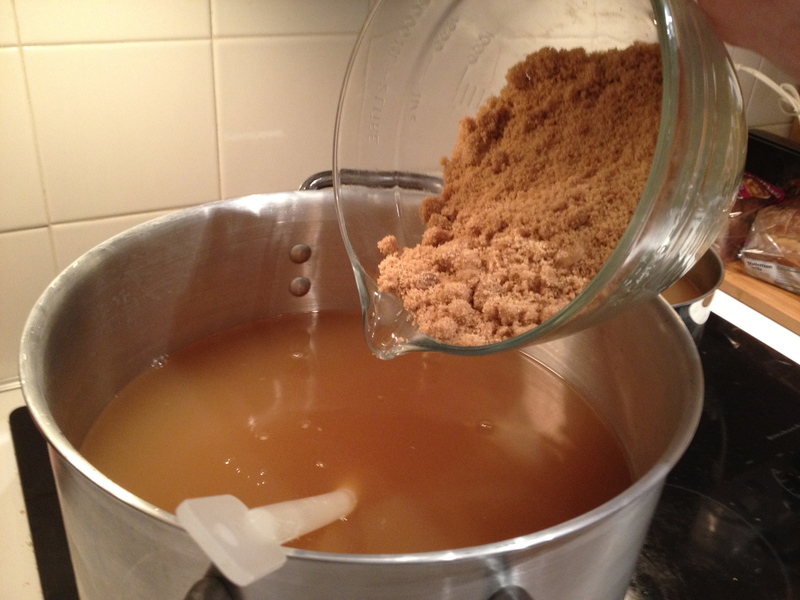 We added some brown sugar to the mix before bottling to give the yeast a little more sugar to chew on. Once the bottle is sealed the yeast will give off a little more carbon dioxide and alcohol, carbonating the cider and upping the alcohol content a little more. We’re thrilled with the taste, and we’re looking forward to the cider sweetening with age. In August, Louisburg Cider Mill will be mashing up fresh cider and you can bring your own bucket to fill. This is supposedly the BEST type of cider to use as it is completely fresh without any preservatives or other yeast killing ingredients. We’ll be making another batch then, stay tuned! There are many differences in this batch from the last one. We stayed with the 2 pounds of brown sugar and didn’t bother heating the cider to kill off any impurities since the cider was already pasteurized. We also added a few ingredients such as pectic enzyme powder, acid blend, wine tannin, and yeast energizer. I’ll update this post as the cider ferments, and we’ll see if this batch is as good as the last one. This entry was posted on Tuesday, April 10th, 2012 at 6:05 pm	and is filed under Uncategorized. You can follow any responses to this entry through the RSS 2.0 feed. You can leave a response, or trackback from your own site. You don’t need to simmer the cider as it is already pasteurized. The cider won’t get sweeter with age … it will just get drier as the yeast continues to eat the sugars. instead of that crappy wine yeast, use an ale yeast. Try Wyeast 3068, Safale S-04, Safbrew S-33 or Nottingham yeast. They will finish much sweeter than the wine yeast and leave you with a better tasting product. Try adding some pectic enzyme to the cider as well if you don’t want to bottle condition it as long to help with the clearing. Also, store it upright, not cap down. The “yeast killing” ingredients are put there to stop fermentation in the bottle of unpasteurized cider. Usually potassium metabisulfate. You can use pasteurized cider sold at the store so long as it contains nothing more than asorbic acid. Also, using a bit of malic acid will give it a nice flavor as will throwing in a few crabapples you have juiced to get some tannins in it. Real Cider apples have a bit of tannin in them to give a nice mouth feel to the cider.